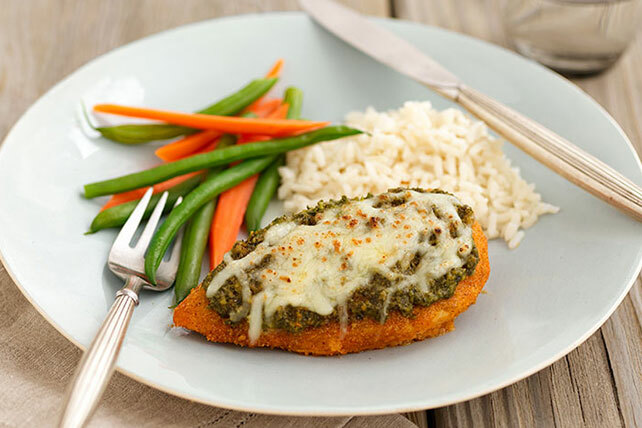 Top a crunchy coating with pesto and mozzarella to get a simply delicious pesto chicken dish. Or, as we like to call it, Crispy Baked Pesto Chicken. Coat chicken with coating mix; place in 8-inch square baking dish sprayed with cooking spray. Top with pesto and cheese; bake 5 min. or until cheese is melted. Serve with hot cooked rice and steamed fresh vegetables.